Join 1000 of South Africa's most dynamic under-35 year old leaders at Emperor's Palace on 23 March 2018 and share in the opportunities available at this unprecedented networking and knowledge sharing event. Nominate yourself or your top young employees or business partners to attend, as long as they under 35 years of age and are destined for great things within your organization or elsewhere in the public or private sector. To build a great South Africa we need our future leaders to stand together and join forces by sharing ideas and knowledge and building partnerships that will last a lifetime. The Tomorrow's Leaders Convention is where our future leaders connect and inspire one another. Be a part of the change. NOMINATE NOW To activate this opportunity to reward your candidates (and to maximise the benefits of their potential for themselves as well as for your organisation), complete the Nominations page http://tomorrowsleaders.co.za/nominate/individual and submit it. NEED TO KNOW MORE? 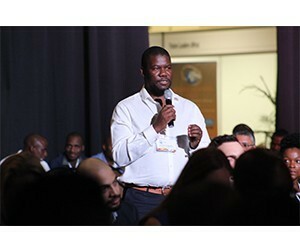 To find out more about the Tomorrow’s Leaders Convention 2018, visit http://tomorrowsleaders.co.za/ or contact Beverley Stone | +27 (0)21 681 7000 | beverley@capemedia.co.za. Join the discussion on Tomorrow’s Leaders Facebook page https://www.facebook.com/TomorrowsLeadersConvention and on Twitter https://twitter.com/TLConvention.